Blake Judd has had a hell of a year. Brought down by scandal after scandal, caught ripping off fans, admitting to substance abuse issues and actually being arrested and imprisoned for theft, he's presented the latest Nachtmystium album as being “the perfect epitaph to this wild ride I've been on with Nachtmystium for the last thirteen and a half years”. Such is black metal, the music wouldn't have as much impact if the artists making it weren't so compellingly human and flawed. Yet while the likes of, say, Burzum's Varg Vikernes can rant and rave and get arrested, he at least seems to have a modicum of respect for fans – even a racist fruitloop can have integrity of sorts, and there's a reason that Varg's name isn't mud in the black metal world while Judd's is. Others have written more on the personal impact of Judd's troubles, and it's hard not to feel sympathy for the victims. Personally, all I know of Judd is that I'm a fan, and I regret his downfall; he's released some fantastic albums under the Nachtmystium label. Yet this is not one of them. Essentially, it's Silencing Machine pt 2, and definitely a much weaker album. From the intro, you know something is wrong; Intrusion feels stock, a basic USBM guitar line undercut by a groovy bassline that doesn't fit at all, launching into a wannabe-epic riff that peters away into nothingness with little effect on the following Fireheart. Here, the rot has really set in, the danceable drumbeat leads the other instruments down a one-way street and feeling like a misshapen experiment that got cut from one of the Black Meddle albums for a very good reason. And the lyrics! It's all woe-is-me: “I've returned from the lowest realms//taken a journey through my own personal hell”, for example. Judd has always seemed to use his band as a diary as much as a musical journey, and this is no different; but there are times on The World We've Left Behind that he's not even attempting to hide it. “You didn't see me coming, and you never will” he snarls on Tear You Down. “Can't you feel my greatness?” Well, although we might have done in the past, we're not feeling it here, Blake. The personal rants often feel like they have more fire behind them than the music. Voyager especially suffers from this, dull musically yet “never knowing who to trust/will you be here tomorrow or disappear into darkness and dust” just one gem from a man who clearly feels that he's being attacked from all sides. It's not a complete Crap of the Month. The instruments are well-played by Judd and his band of hired hands (including Hate Meditation drummer Sam Shroyer) but they can't help but feel a bit of a step-down in quality from the Sanford Parkers and Will Lindsays of before. A couple of songs even approach brilliance – Into the Endless Abyss, for example, is a powerful black metal roar, pushing the electronics into the background and even making the lyrics work in its favour - “the demon has awoken again!” is the first line, and Judd may be referring to himself, but it's effective here. Even when the electronics resurface in the second half of the eight-minute track in a kind of Hawkwind-y whistling effect, it doesn't detract from the track's power; a sad reminder of what Judd is capable of at his best. The same goes for In the Absence of Existence, a more melodic and mid-paced track that hits the desired self-pitying atmosphere and feels truly melancholic, although it does go on a little too long. Yet even at my most forgiving, I can't overlook how much the likes of the title track and On the Other Side drag, or the lack of ideas shown generally after the quite radical Black Meddle albums. Tear You Down would work well on a better album, drenched in effects and having a weird catchiness to it, but here it's just another vehicle for the whining. That Judd avoided any 'my lifestyle determines my deathstyle'-type horrors is a compliment of sorts on an album that feels like it's full of that sort of self-obsession. It utterly spoils the closing Epitaph for a Dying Star, which brings in female vocals and tries to resuscitate that psychedelic edge that the band once had, to little avail. No Funeral felt edgy and exciting on 2010's Addicts; there is nothing remotely as interesting here. The World We Left Behind feels seriously lightweight compared to past efforts, half-hearted, dull and thrown-together. 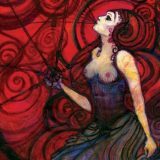 It isn't helped by the confusion over whether or not it is the final album from Nachtmystium; it was initially trailed as such by Century Media, then Judd seemed to change his mind in interviews. So, a bit of a mess all around; is Blake Judd going out in a blaze of fiery glory, as he would have us believe, emerging phoenix-like? No, he's still struggling to escape the mud that dragged him down in the first place.